Start making money by easily developing your database leads, by location, business category. filter your leads, sale your leads. Etouch works 100% with LinkedIn. Etouch provides with a unique solution to manage all your Linkedin contacts, by using the search option FIND, you can search your contact my company and then you can regroup all the searched contacts within the same company, then you can build your marketing strategy based on either the company name or the job title, or even both. 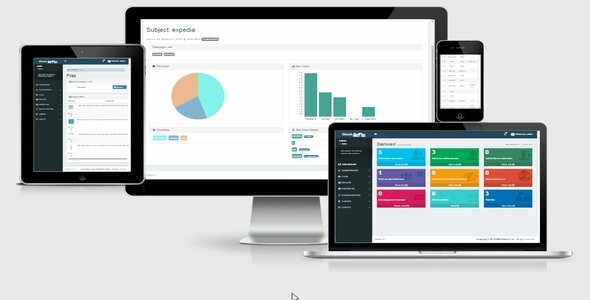 This functionality is very practical for those seeking to target certain business segmentations such Human Resources Managers, CEO’s, Suppliers, Decisions makers etc. Etouch is by far the only bulk email applications that makes it easy for users to create a beautiful newsletter or marketing campaign, thanks to its customized Ckeditor everything is within reach. You can add premade templates in a click of a finger, you can even add your own templates or html section as click and drop. With its social icons & share, you can include your preferred social media networks easily. You can also use the drag and drop campaigns scheduler to send targeted emails on holidays or any social events. tracking your campaign got also easy, thank to both native email behaviour tracking and URL shortner api integration, you can make divers colorful barcodes and qrcodes to implement directly into your campaign, each is trackabled for better understanding of the success of you marketing strategies. Working images as adding texts and patterns is also supported, thank to Aviary integration, basically, you do anything with it. Etouch can support multiple SMTP servers, capable of working in parallel and also jumping to the next available server as soon as your established limit is reached. – Multi-users / Languages (French/English and can be easily support any other language). each user has his distinct account, only the master admin have access to users area. – Unlimited Groups (Deep List Segmentation). – Unlimited Smart SMTP Servers Relay: SMTP, PHP Mailer, Gmail (Auto Detect & Bounce Servers Limits). – Bounce Mail Handler (PHP Library should be enabled). – Parallel Delivery (In respect to each server limit). – Address Validator & Finder. – Export to Multiple formats: VCARD, CSV, EXCEL, PDF, & Most used Avery Labels. – Ajax Subscribers CSV Load (for Copy Paste). – Easy members import using CSV or Linkedin VCARD. – Find Subscribers based On Language, Address, Status or Groups. – Smart Campaign Scheduler Calendar. – Single & Double Optin. – Internal Activity Log Table. – Campaigns History, Export, and Duplication. – Campaigns Activity Tracking, Bounce, Open, Unsubscribe, Sent, Unsent etc. – Advanced Graphical Statistic Reporting. – Form script Integration (Installation). – Adobe Aviary Image Editing. – Native Captcha Spam System. – Cache Memory Limit Control for faster processing. – Send Emails in Batches. – Ckeditor/CkFinder with beautiful Plugins: Social Icons, Google Map, QRCode,Ipsum, Media Share Links). – Custom Pre-Built Templates easy Insertion. – CSS Inliner (Emogrifier) on Campaign Processing. – Free Professional URL Shortner API Code, with QRCode, Barcode, (with color Schemer). – Subscribers Imports Limit Control for faster processing. – Subscribers Tags (First Name, Last Name, Address, City, Zip Code, State, Country, IP Address, Web etc..). We are also available for any customization or support for this script. Please make sure that your PHP version does not exceed PHP 5.4.